It was obviously unreasonable to expect the store keepers pull down the balloons set up to decorate the store, just to appease a demanding toddler. My toddler cousin was determined to have his way or all around would feel his angst! I had a choice. I could deliver him from causing an embarrassing scene by asking a shop assistant for just one balloon to calm the imminent storm, or I could let him go through with his storm which would have a time span anyway. No one cries forever! The benefit of not rescuing him was hopefully a lesson would be learnt, or at least the chance of it and he would gain the knowledge of learning better ways to manage his desires, met or unmet. I continued walking away from the balloons and his screaming got louder. I resisted the urge to turn round as he progressed to rolling on the store aisle, yelling louder still. Carefully keeping an eye on him with quick glances, I ensured he could not see me. There must have been a moment of panic, for he suddenly rolled up and raced in the direction I had gone. At this point I kept walking, determined he would not know I had been waiting. I held his hand gently as he got to my side, no longer screaming, and without one look at him we walked quietly out of the store as he regained normal breathing……He pointed to the ice-cream van, still short of breath, when I softly responded it would have to be next time if he behaved well. He was silent, no tantrums. I have been thankful for that moment, as since then we had many more trips together which he handled better. I ensured he was always rewarded for the subsequent good “behavioured” trips. It has been decades ago, and I have no doubt that was one of the exercises that has made him turn out the fine young man he is now, admired by many. A person known for anger needs to learn you can’t sow lemon seeds and harvest sweet oranges! Any process that feeds that delusion enhances deceit that is ultimately destructive. 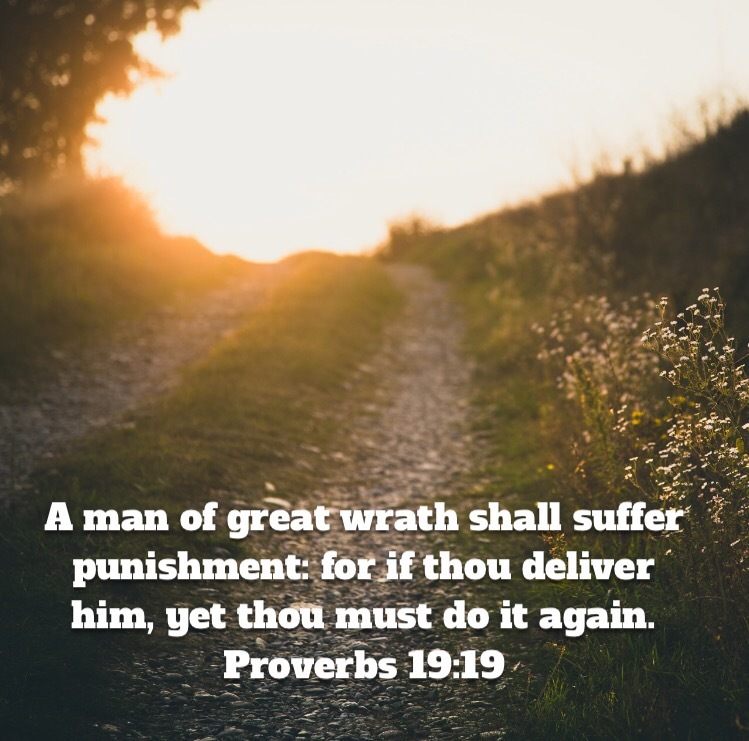 Rescuing “a man of great wrath” from deserving consequences, is nurturing an unhealthy trait that could cause damage to him and others. Anger must be followed by its ideal consequences else others will have to unjustifiably expend their energy and resources to rescue the angry one. Is it wrong to be angry? No. Anger should be within healthy limits, like anger at injustice. Unhealthy anger is that which is damaging!